The book pens a journey with Mary, the mother of Jesus, as a framework for pondering life lessons, or songs, of grace-filled "yes" to God. 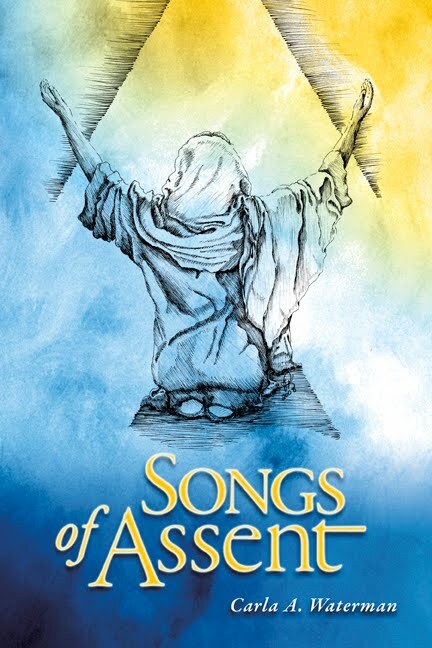 April 1st marked the first anniversary of the publication of Songs of Assent. This year has been an amazing season of watching a creative work breathe on her own and find her own way in the world. Every time I have held my breath as I leafed through the pages wondering if I really said what I wanted to say, my pulse has slowed down gradually and I have thought, "It's alright. It is good just as it is." And I can say this even when I have been pointed to rich truth in the last year that I wish had been included. The new publishing technology of print-on-demand (POD) books has offered Pam (my sister and illustrator) and me a medium for creation that has come with the delightful adventure of marketing the book as it was written: receptively, one opportunity at a time. There came a day a few months ago when we sold a book that appeared to be a "fourth generation" word-of-mouth sale. I didn't know the person who told the person who told...well, you see what I mean. I value such delightfully nuanced connections incongruously made possible by our high-tech world. But with the first anniversary of publishing and the London conference, I find my heart and mind moving to other topics and other sites. You can find me blogging regularly at www.worshipedia.org on themes connected to worship, and, soon, on a more open-ended blog to be housed on my new site. However, if you are new to Songs of Assent, I invite you to explore the blogs I have written here this past year. You can organize them by "song," and because the original themes from the book were uppermost in my mind during this past year, I hope you will encounter insights that will enrich the reading of the book. And, whether you are an old friend or new, I invite you to check back here for an announcement on the inauguration of my new website. I would enjoy your continued company as we learn new songs of "yes" to God to accompany the ones we already know. The problem was really quite defined. No guesswork involved as to the nature of the need or the human perplexity as to how to meet it. They had run out of wine before they ran out of party. The anxious moments behind the happy communal occasion were not earth-shattering in the vast panorama of human existence. Yet here, in the quiet, unobtrusive moments of a family’s crisis where human limitations were only obvious to a few behind-the-scenes-players—here began the miracle of Jesus entering into the heart of human anxiety. But not without his mother tasting a bit of that anxiety as well. Was she perplexed with her son’s response? She certainly doesn’t get an immediate answer. And she had had eighteen years to adjust to the rules of engagements her twelve-year-old had once ushered her into: I must be about my Father’s business. There is another kind of response we can make in those all-too-human moments when we are confronted with our human limitations. We can allow the dark moments of uncertainty to become a condition rather than a passage. There’s no more wine (or money, or job, or relationship). And we can get stuck in the darkness, struggling to find another supplier, setting up our own tenuous securities, building bigger wine cellars. When anxiety is a condition rather than a passage we will do ANYTHING to deny that behind the façade we are finite mortals who would find our greatest freedom and joy in dependence, not independence, on bringing our need to Jesus, rather than seeking other ways to replenish the wine at the wedding. But, of course, when Jesus acts—in his own way and in his own time, in response to dependent human need, the wine is SO much better. What a delightful first step in a whole series of Jesus' revelation of himself in the midst of human anxiety---whether in supplying wine, or raising a friend from the dead. And his mother? Through her last recorded words she teaches us how to move from light through the darkness and back into light. Quite a mentor, that Mary. Her story began in earnest with a clarion call from an angel. “Don’t be afraid, Mary, you have found favor with God.” But not too many chapters in, the plot got more complicated. An old man in the temple recognized this unique family for who they were, rejoiced that the Lord has allowed him “to see thy salvation” and then has a serious conversation with Mary. “This boy is destined to be the rise and fall of many, so that the thoughts of many hearts will be discerned, and, oh, by the way, a sword will pierce through your own soul, Mary. At some point in the next couple of years, Joseph would awaken her with a dream that Herod was purposing to kill this child. And so they left Bethlehem under the remaining cover of darkness and made their way to the land of exile, Egypt. When did she hear that her Bethlehem friends’ infants had all been killed? And what did she make of another escape, this time in plain view, when her twelve-year old remained in his Father’s house, while she, along with his “father” frantically retraced their steps. It must have a panic-stricken experience to misplace this son, and an emotionally-jarring one to be reminded of the prioritizing of his fathers. But that sword would probe for still more of her heart when Jesus began his ministry, beginning with her neighbors wanting to throw him over the cliff. How DID one start a conversation at the well the next morning in the midst of such anger and rekindled suspicion? There are moments of reprieve; when a woman in the crowd wants to praise Jesus’ mother, Jesus merely redirects the reason from her body to her spirit—blessed are those who hear the word and keep it. “I am the handmaiden of the Lord” certainly qualifies. But in the midst of the struggle to understand this son, while experiencing the lack of understanding of her neighbors and family, Mary does not waver. A mature woman eventually stands under her son’s cross, bearing the final severing from her son as the sword cuts all human ties to Jesus as she is given to John to be cared for. Her vocation to live in front of the sword has been carried—all the way to the cross. All along she is favored; God is with her. But such loving favor does not spare Mary from pain and fear, from walking for long periods without light, without understanding, without unity among those she loved best. But when we last see Mary, seated in the upper room, waiting with the other disciples and her other children for her son to send His Spirit, I expect we are seeing the calmest person in the room. She has walked her own unique road of discipleship. Yes, a sword has pierced her soul, but it has not destroyed her. Blessed is she who believed that what the Lord said would be accomplished. 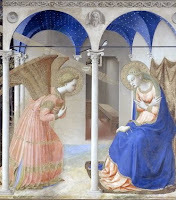 Gabriel sends Mary hurrying to Elizabeth with a child in her womb and wonder in her heart. One wouldn’t think she could be more filled at the moment. But the Holy Spirit who has overshadowed her womb spills out all around her. John the Baptist leaps for joy in Elizabeth’s womb. Elizabeth is filled with awe, wonder and blessing upon blessing for her young relative. In the end, Mary sings a magna, a song of “great things.” She sings it with so much beauty and skill that some contemporary biblical scholars believe it was humanly impossible for Mary to have sung it. Surely the early church later placed it in her mouth. I tend to approach the issue from a more child-like place. It was rather impossible for a virgin to bear a child, too. The song is a masterpiece of biblical poetry. It begins with the testimony of one hidden woman, and ends with the Word God spoke to Abraham and his seed forever. Mary looks forward with joy to a church of which she, in hidden humility, has become the vanguard; she looks backward to the God who, remembering his compassion, has never ceased to uphold a small nation called Israel. But the centerpiece of this crown jewel is verse 51: “He has shown strength in his arm; He has scattered the proud in the imagination of their hearts.” Mary’s God, Yahweh, “He who causes to be,” has initiated his ultimate creative act by begetting his own son in the vulnerable womb of an unmarried girl. Only One endued with the potency of real creative strength could act with such effectiveness in the midst of weakness. A lone sojourner with a barren wife becomes the father of many nations, a reluctant shepherd with nothing but a staff and the name of his God becomes the deliverer of his people. A faithful, but impoverished, daughter-in-law collects left-over grain and becomes the great-grandmother of David. A monk struggling under the weight of guilt becomes the catalyst for the Reformation…and I find myself pondering the secret places where this strong, creative arm is moving even now. Mary teaches us this: the contrast to God’s creative power so often manifest in weakness is the illusory strength of the proud who are “scattered in the imagination of their hearts.” I only wish I didn’t know what that meant. But I do. My heart has often been too easily fired by a vivid imagination that creates paper-thin pseudo-reality for a moment (or a year)—only to watch it “scattered” with the first gust of real wind. Father, please send your Spirit into our hearts, that we may be given wisdom to internalize your priorities, eyes to see their incarnation in our midst, and hearts to wait patiently for that which is hidden to be revealed. After all it’s an expression that we find first and last on the lips of the Godhead. At the moment of creation. God says. “Let there be light [according to MY word]. And it was so. And at the pivotal moment where the God man sets his face toward the cross, Jesus cries out, "Father, if you are willing, remove this cup from me. Nevertheless, not my will but thine be done.” (Luke 22:42). These are bookend fiats. The creation fiat brings life in all its fullness, the crucifixion counterpart embraces death and all that provokes it so that fullness of life might again be restored. And in between these two firm acts of will lies the response of a young girl. For Mary’s “let it be to me according to your word” is this living desire of a mere creature to surrender her whole life as a tablet for God to write his story upon. But Mary’s deep receptivity is not based merely on the presence of a terrifying angel with amazing news. Gabriel first establishes the basis on which his words are to be trusted. She is folded into the Mosaic covenant in which the presence of God is synonymous with God’s favor. And she is directed to the Davidic covenant where a child from her womb will be given the throne of his father David. Her fiat rests on the foundation of substantive revelation. She is drawn as participant into a story she already knows—at least in part. And in the gracious confidence of recognizing truth and responding to it with all her heart, Mary borrows a bit on her son’s total embracing of personal death so that others might live. Fiat this side of the fall always comes with a price. Yet there is one final fiat. “Thy kingdom come, thy will be done on earth as it is in heaven.” It is the “let it be” of the Church and every Christian soul within her. Perhaps we would do well to learn to pray the Lord’s prayer with the immediacy of Mary. May your kingdom come, your will be done on this bit of earth, in the dust of my flesh, that heaven and earth might just kiss each other on this day, in this place. “It is so. May it be so.” Today. The scene? Last Saturday afternoon as our class on the Sacred Actions and Ministries of Worship gathered in a little historic chapel at the Robert E. Webber Institute for Worship Studies for a service of baptismal renewal. The teaching on renouncing the schemes of the evil one was behind us, the water in which we would meditate on what it meant and still means to be brought into Christ through baptism lay before us, and in between was the moment to turn away from the centripetal force of the world, the flesh and the devil and affirm once again the foundational realities of our faith. The latter comment was my own. I have recently become painfully aware of my unbelief that God truly favors and delights in his children, and that his heart was, is, and always will be to bless us. In the last decade I have lost my child-like wonder of God's favor. It has not been a particularly smooth season, and somewhere along the line, my need to endure, while true, has been overshadowing God’s immense heart of mercy, love and delight. And so, last Saturday, in addition to the ongoing repentance of my unbelief, I renounced the liar who buzzes around my head with the image of a God who demands but never delights. Oh. In the fullness of time Mary was the first to be highly favored. But she is not the last. She once bore the Beloved, that the Beloved might bear us forever. Greetings, oh favored ones. The Lord is with us. A casual observer would have thought, “Now there is a woman who needs a life.” New Year’s Eve: My husband, in the midst of his busiest season at the college bookstore (and having shoveled for three hours on the college’s holiday snow crew) was in bed at 9:00 and I was watching half a season of “Murder, She Wrote” reruns and crocheting a scarf. 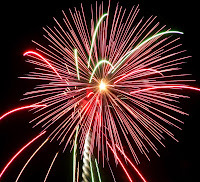 Fireworks rang out very close by as the year changed—Wyatt reports that he was awakened by our backyard neighbors putting on quite a lovely display, and I could hear the uninhibited cheers that accompanied the popping and the colors. Hurrah, 2010. What difference does it make that I am a Christian as this new year begins? I, along with my brothers and sisters throughout time and space, have been drawn into a story of re-creation, where we are profoundly loved by a God who makes small things, like a wedding party, richer; and is making large things, like “all things,” new. His arm is strong, and he will NOT let us go. And this gives me the courage and hope to celebrate the coming of a new year. I no longer possess the natural optimism of the cashier who looked at me with determination and said, “2010 is going to be a GOOD year. Let’s hope the economy continues to get better.” Neither am I a cynic who has concluded that nothing will ever change—although I am old enough to sympathize with the impulse. I am, rather, a woman gratefully drawn into the story of a God who would not and will not abandon his broken creation, and who continues to pour the new wine of courage, strength and hope into his people as we press in and press on—until that day when all things are fully made new. Come, Lord Jesus. And that is cause for rejoicing. Happy New Year. 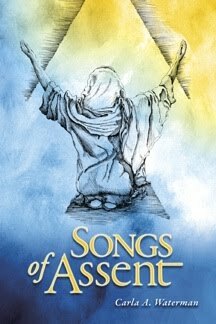 IWS Chapel Talks on "Songs of Assent"
Subscribe To "Songs of Assent"
Some authors, when you read their works, you think, "Yes! I know this. I've lived this. I've just never been able to put it into words like this person or received insight into this until now." Some authors elucidate Scripture, human nature (both good and ill), and wise counsel, and they do it pointing to Christ all the while. Carla Waterman is such an author. I have been waiting for this book for 10 years. I heard Carla Waterman speak on the formation of the soul in 1999, and she was saying things I had always longed to understand but had never even heard articulated. I wished then that she had a book I could take home with me, but the interim period seems to have only given her a fuller understanding of these deep truths and has ripened the fruit that was just beginning to form. This book is well-written, deep, and yet very down-to-earth. It is not a quick meal--it takes savoring and pondering. Using the life of Mary as a framework, it explores different Christian virtues/attitudes that are the among the step-stones on the pathway to growth in Christ. Waterman paints beautiful word pictures and gives vivid real-life examples of how we can echo Mary's willingness to allow Christ to be formed in her. I have given this book to all of my closest friends, and I would recommend it to any Christian (man or woman) wanting to grow in the daily reality of Chirst being formed in them. "Yes to Songs of Yes!" Most books about the virgin mother of Jesus seem to land in one of two categories. Either they revere and spiritualize her to the degree that most non-Catholics can't stay on board or they humanize and romanticize her to the degree that those from more sacramental traditions have to in turn, turn away. "Songs of Assent" finds not just a middle ground, but perhaps even a nobler path. Here Mary is celebrated in the fulness of her humanity as well as in her intimacy with deity. Her dynamic songs of yes include the simplicity of the yes in her "Let it be to me according to your word," the grand wisdom of her yes regarding the implications of the incarnation for all humankind in her "Magnificat" and her buoyant yes so powerfully implied in "Do whatever he tells you" at the marriage feast in Cana and more. Through beautifully poetic language, Waterman's Songs of Assent creates a doorway into grace. By weaving Mary's journey in with her own, Waterman presents her own response to God's grace both in words and creative pen and ink drawings.